Die Öffnung des Innovationsprozesses von Organisationen ist in der heutigen Forschung & Entwicklung ein wichtiger Schritt, um sich der Ideen und des Wissens der Außenwelt als strategisches Werkzeug zu Nutze zu machen. Jedoch gibt es keinerlei Artikel, welche Auswirkungen die Implementierung von "Offenen Innovationen" in der Unternehmensentwicklung haben. Diese Bachelorthesis soll hierfür den Nutzen von "Offenen Innovationen" im IT - Service Bereich, sowohl in der Forschung & Entwicklung als auch deren Übertragung in die strategische Unternehmensentwicklung aufzeigen und mögliche Schneeballeffekte definieren. Die Untersuchungen zeigten, dass die Implementierung von "Offenen Innovationen" in das Unternehmen einen maßgeblichen Einfluss auf die Unternehmensentwicklung und die Wettbewerbsfähigkeit hat. Durch diese Bachelorthesis erlangt der Leser einen Überblick über die Beziehung zwischen "Offenen Innovationen" und deren strategischen Nutzen. Besonderer Dank geht an meine beiden Betreuer, Herrn Prof. Dr. rer. pol. Gerhard Killy von der Hochschule Reutlingen und Herrn Dr. Rob Dekkers von der UWS Business School, University of the West of Scotland, die es mir ermöglicht haben, meine Bachelorthesis über dieses Thema anzufertigen. Ich danke Ihnen für die vielseitige Unterstützung und Betreuung meiner Bachelorthesis. Desweiteren möchte ich allen Personen danken, die mich bei meiner Bachelorthesis und bei meinem Studium unterstützt und begleitet haben. The opening - up of the innovation processes within organizations is an important step in today's Research & Development in order to take advantage from both, external knowledge and ideas as strategic instruments. However there are no articles about the influences for implementation of Open Innovations into the Business Development. Therefore this dissertation should demonstrate the utilization of Open Innovations within the IT - Service field for both, the Research & Development and their assignment within the Business Development. Furthermore possible snowball - effects should be defined as well. The investigations showed up, that the implementation of Open Innovations have a major impact on the Business Development as well as the competitive advantage of an organization. 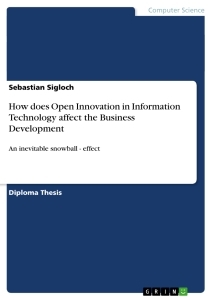 With this dissertation the reader obtain an overview over the relationship between Open Innovations and their strategically usage. Special thanks are going to both of my advisors, Prof. Dr. rer. pol. Gerhard Killy from the Reutlingen University and to Dr. Rob Dekkers from the UWS Business School, University of the West of Scotland, which made it possible to write my dissertation about this topic. Thanks to all persons, which supported and accompanied me during my dissertation and my whole studies. How does Open Innovation in IT affect the Business Development as an inevitable snowball effect? 2. How is the Open Innovation - paradigm used within IT - Services? 3. Is there a relationship between the implementation of Open Innovation and the Business Development? 4. Is it possible, that the implementation of the Open Innovation - paradigm leads to competitive advantage? 5. Can the mutation from the Closed Innovation - paradigm to the Open Innovation - paradigm lead to an inevitable snowball effect? The document overview can be illustrated by the following process, where the questions 1 - 5 can be again recognized as well. Within the first chapter, the Open Innovation - paradigm should be differentiated from the traditional, Closed Innovation - paradigm. In order to illustrate changes in Research & Development, an historical approach will show up the differences between the ways of innovating. Furthermore the Open Innovation approach will be integrated and evaluated traditionally. Additionally this chapter should show up possible implementations of the Open Innovation - paradigm within the IT Service industry, especially the usage of Web 2.0 technologies, by using a string of examples. In the early days', the Research & Development was seen as the treasure of an organization. D. Nobelius [Nobe04] showed up 5 generations of Research & Development management (cf. Table 1). Early Adopters like the Marshall Space Flight Center [Msfc11] in Alabama acquired external knowledge in the 1950's in order to develop their rockets technology, which were necessary for their Apollo 11 mission, which had the target to land on the moon.,, Hence spaceflight technologies as well as electronics, computers and radio technologies became part of the 20th century innovations. Research & Development management became, regarding to D. Nobelius [Nobe04] part of the corporate strategies and were integrated moving-away from a product focus, towards a customer integration. Nowadays the information technology industry as well as the economically benefits of innovation and education became important parts of the upcoming changes during the 21st century. The processes of innovation, which should help companies utilizing and advancing technologies in order to create new products and services, were explained by Chesbrough [Ches06] as "A Tale of Two Models", which will be closer looked at in chapter 1.2. For the 21st century success, the Open Innovation - paradigm seems to be an important factor within the Research & Development. Innovation is expensive. Companies are finding it increasingly difficult to justify increasing R&D costs. In regards to Henry Chesbrough [Chesb06] this is enhanced by decreasing product revenues due to shorter product life cycles for example within the Electronic or IT sectors. Additionally companies require greater knowledge, regarding to Bowonda et al. [Bowo05] in order to compete more markets within the globalizing world. In regards to Fetterhoff & Voelkel [Fett06] the values of companies lies in their brands rather than in the ability to invent products or manufacture them. This implicates the "outsourcing" of innovation as well as divesting of productions. In regards to Henry Chesbrough [Ches03], no single company knows everything. Additionally knowledge has become distributed in universities as well as in web-based communities (cf. Chapter 1.3.2) and we are witnessing the obsolescece of Research & Development in many industries. D. Nobelius [Nobe04] mentioned, that the new generation of Research & Development is taking place with cross-boundary alliances. These alliances involve company networks and the new generation of Research & Development is focusing on the integration of different systems. Thus Open Innovation should provide new ways to create value outside the firm boundaries. This doom loop show up, that increasing investments within the Research & Development will lead to fundamental technology breakthroughs. These breakthroughs lead to, like the before mentioned rules explained, to new products and features. These new products will increase the sales and profits via the existing Business Model. The gained profit can be invested again into the Research & Development and let the doom loop restart again. Furthermore the intellectual property, which arise from the internal Research & Development is, like in the beforehand mentioned rules as well, closely guarded so that competitors don't get possibilities for profiting from other's Research & Development findings. The following graphic (cf. Figure 2) which has been modelled after Henry Chesbrough [Ches06] should explain the flow of ideas and Research Projects within the Research & Developement funnel. Ideas as well as Research Projects enter in the funnel at the left side of Figure 2. Subsequently these Research Projects's as well as the ideas from scientists or research employees within the Research & Development department will be proceeded and transformed within the boundaries of the organization. In doing so, the funnel is acting like a filter in order to get rid of false Research Projects and ideas. Finally the combination from Research Projects and ideas will be developed and later launched on the determined target market to reach the customer. Alterations of the former abiotic environment led to jiggle the underpinnings of the Closed Innovation paradigm. According to Henry Chesbrough [Ches06] it seems obvious that since education factors, which include a burgeoning amount of university - trainings as well as postgraduate trainings, the knowledge is distributed and not concentrated to company-trainings anymore. Moreover these highly skilled and experienced people undergo a growing mobility. Thus concluded in highly capable start-up companies, which could use the growing presence of private venture capital in order to commercialize external research into valuable companies. Furthermore the increasingly fast time to market for products and services challenged the traditional approach of Figure 1. Customers gained knowledge from university graduates, what punched a hole in companies knowledge-edges. All these factors alter the approach of Closed Innovation and led according to Henry Chesbrough [Ches06] to a "new" approach, Open Innovation. The figure above illustrates, that there are not just disadvantages with the mutation from the Closed Innovation - paradigm to the Open Innovation - paradigm. Like explained before the blue arrows show incoming Research Projects's, ideas or knowledge which could be used in order to get potential new technology breakthroughs. The green and the orange arrows from Figure4 showed the process of scientists who could leave the company with the knowledge or idea in their backpack. However these new processes and ways to new or other markets, showed in B and C, can be used in order to eradicate former false Research Projects's. Serhan Ili [Sili09] stated, that due to a pointedly usage of external ideas as well as technologies, an organization is able to expand their actual innovation basis for their business activity. The Design Against Crime Research Centre [Dacr11] extended the model of Figure4 by showing a possible inter-divisional approach of Open Innovation (Figure6). Each color would show another division of the company. The normal Research & Development outputs induce hereby still the current market. This model show us, that Open Innovation helps to gain possibilities to expand the customer reach. However the idea to open up the Research & Development out of the firm boundaries is not a new train of thoughts. It seems that the Open Innovation - paradigm has its roots within the Stone Age. David Murray [Murr10] stated, that existing concepts have altered and combined to construct new concepts. A Neanderthal man could accidentially dislodged a large rock as he climed on a hill. The rock rolled down the slope and he thought about the first rock-wheel. Thus implicates, that observations of the nature has been used as a kind of external information in order to develop something new. The first openness is born. External ideas have been borrowed and used for the own Research & Development. At a later time, these borrowing of ideas seemed to still apply. David Murray [Murr10] stated, that even Einstein's complex ideas were borrowed out of existing ideas. Even Einstein itself said: "The secret to creativity is knowing how to hide your sources". In regards to David Murray [Murr10] Teresa Amabile from the Harvard Business School said, that "All innovation begins with creative ideas". Nowadays the open up of the Research & Development has been explored in Business since more than 50 years on how the best way to exploit knowledge from beyond the firm. Trott & Hartmann [Trot09] determined the in Table 1 mentioned principles for the Closed Innovation as well as the Open Innovation - paradigm. Early adopter like Roy Allan [Alle69] and M. L. Tushman [Tush77] identified. Furthermore they explored that much technology and expertise is lying beyond the firm boundaries as well as who is collecting and exchanging knowledge and information on behalf of the firm. Thus findings are finally against the first principle of the Closed Innovation - paradigm, see also Table 1. Furthermore Trott & Hartmann [Trot09] determined, that since the 1970s many technology partnerships as well as new joint ventures between organizations arose rapidly. Thus implicated a fall of the going alone strategy. Businesses slowly broaden their view and formed strategic alliances. These alliances can be interpreted as a slowly opening up of the firms boundaries within their R&D processes. These changes refute the second Closed Innovation - paradigm principle. For the third principle there are some contradictions as well. Trott & Hartmann [Trot09] mentioned, that technology alliances provided new Research & Development opportunities. However these technological alliances do not always lead to increasing profit within the own Research & Development. Xerox' Palo Alto Research Centre (henceforth. : PARC) determined some technological breakthroughs, on whose they weren't able to profit from their technology. For example they determined the graphical-user-interface technology, which became later usage in today's well-known computer mouse. The fourth principle has been investigated by Trott & Hartmann [Trot09] as well. They found out, that being the first on the market doesn't ensure the competitor - victory. In the commencement of personal computer for example, the company Micro Instrumentation and Telemetry Systems (henceforth. : MITS) with their personal computer Altair 8800 as well as Apple with their Apple 2 were the pioneers for the first personal computers. However the first doesn't meant to be the winner. IBM as well as Compaq and Dell dashed on the former personal computer - market just a few years later and won the market race. Another famous example for that can be found within the search engine market. This example clarifies that not the first on the market means to be the winner. Altavista from a DEC - Research Project arrived on the market in 1994 and was the first full text search engine and was the fastest method for finding information on the World Wide Web. Yahoo followed one year later with their search engine 'Yahoo!' and acquired the competitors 'Overture', 'Altavista' and 'AlltheWeb'., Nowadays Page's and Brin's Stanfort Research Project 'Google' is today's market leader with a market share of more than 82%, which is definitively the winner on the search engine market. Like Trott & Hartmann [Trot09] stated: "The pioneer was overhauled by the late entrant that developed a superior algorithm, facilitating more accurate searches." Henry Chebrough [Ches06] believed that, if a company creates the most and best ideas in the industry, then this company will win the competitive-race within the Closed Innovation - paradigm. Even this believe seems to be made up out of thin air. Trott & Hartmann [Trot09] as well as B. Hindo [Hind07] explained that 3M faced a lot of creativity on how to research on technological breakthroughs. However 3M struggled with their efficiency and the captured ideas couldn't be converted into products and services. The sixth and final principle of the Closed Innovation - paradigm which was stated by Henry Chesbrough [Ches06] seems to be unreal as well. The intellectual property of companies which achieved technological breakthroughs has been licenced. 1975 Paul Allen and Bill Gates informed MITS that they got an interpretor for the Altair 8800. The thereupon founded company 'Microsoft' became MITS' general licensor. The sucess of Microsoft today should be adequately known. see also: [Coso03]: A Century of Innovation: Twenty Engineering Achievements that Transformed our Lives, p. 7 et seq. see also: [Ches06]: Open Innovation - The New Impertative for Creating and Profiting from Technology, p. 22 et seq. see also: [Trot09]: Why 'Open Innovation' is old wine in new bottles, p. 718 et seq. How does Auditory Processing Disorder Affect Teenagers in their Working Relationships?